Peppermint Bark Chocolate Chip Cookies-Chocolate Chip Cookies with chopped up peppermint bark, chocolate chips, and a sprinkling of flaked sea salt. These are the perfect chocolate chip cookies for the holidays. It isn’t officially the holiday season until I open up a tin of Williams Sonoma Peppermint Bark. It is the best peppermint bark and a MUST for December. I look forward to opening a tin every year…or two or three:) I can’t get enough! It tastes like Christmas and great to have around for holiday parties, gifts, and cookies! Yes, cookies! I also like to use it to make Peppermint Bark Chocolate Chip Cookies. 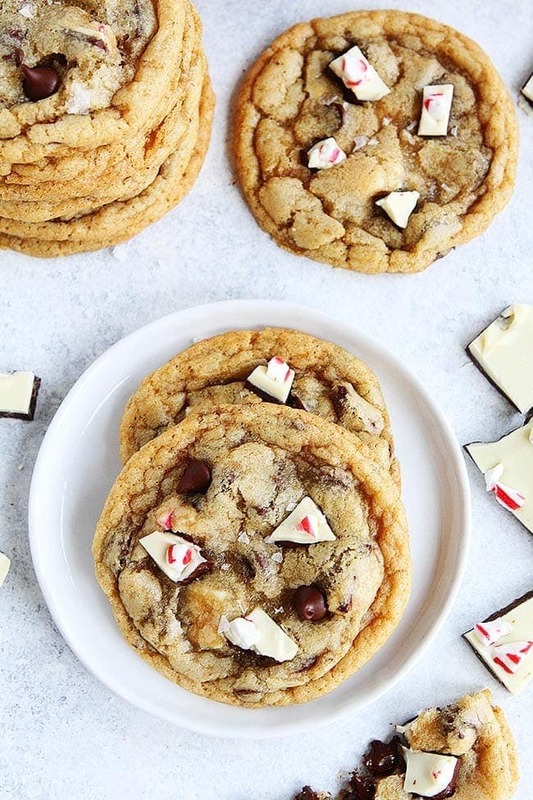 I chop up the peppermint bark and add it to chocolate chip cookies and the results are EPIC! This year is marks the 20th anniversary of the peppermint bark and Williams Sonoma hid over 1,500 gift cards inside peppermint bark tins, so make sure you check your tin to see if you are a winner! So fun!